A place that offers diverse experiences that range from culinary to entertainment, Singapore is truly home to great fun and indulging activities. Fancy a fun way to explore Singapore like never before? From bungee jumping to flowboarding, here are 6 absolutely quirky things to do that are guaranteed to boost your adrenaline levels and get your heartbeats pumping. Are you ready? Located on the top floor of Cineleisure Orchard, Bounce Singapore is the city’s largest indoor trampoline park and adrenaline arena for kids and adults alike. With three areas that are specially designed for a variety of activities and span different levels of difficulty, children, teenagers, and adults are all welcome to work up a sweat here. Showcase your basketball skills at the Slam Dunk, scale heights at The Wall, play ball at the Trampoline Dodgeball arena, and defy the rules of gravity at the Leap of Faith. On top of that, Bounce Singapore also offers weekly activities such as Bounce Fit that cater to fitness junkies and even freestyle parties where interested parents can book the park for their kids’ birthdays! If you are looking for an exciting way to soak up all that sun when you find yourself in Sentosa, why not book a surfing session at Wave House Sentosa? Offering a variety of simulated surfing activities right at the heart of Siloso beach, unleash your best surfing moves at their flowboarding areas. Combining surfing, snowboarding, and skateboarding, boarding enthusiasts are guaranteed to fall in love with their FlowBarrel and Double FlowRider rides. Long day of surfing at Wave House got you feeling tired? Fret not! Guests can also chill out at their pool and beach bar after an afternoon of flowboarding. 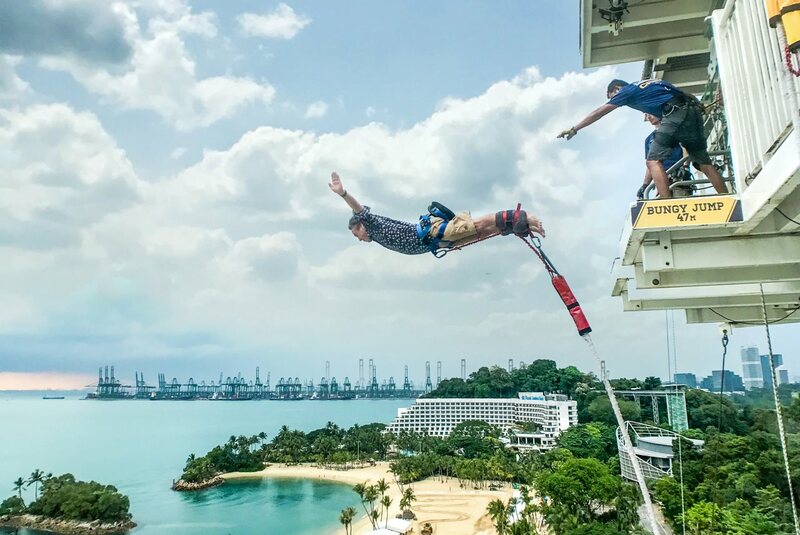 As Singapore’s first and only bungee jump that towers more than 40 meters above Siloso Beach, AJ Hackett Sentosa is definitely not for the faint of heart. For all the thrill seekers and adrenaline junkies out there, gather all your friends and fly over the canopy of Sentosa on their Giant Swings, which is the first of its kind in the world. Don’t have friends who are as gutsy as you? No worries at all! You can take a nosedive or backflip your way down on their signature freefall bungee jump. That’s not all either. Give yourself an ultimate challenge by taking on their vertical skywalk where you can walk face down the side of their 40-metre tower. Indoor rock climbing walls not cutting it for you anymore? Try giving yourself a challenge by scaling the natural rocks of Dairy Farm Nature Park near Bukit Timah! A former quarry that transformed into a nature reserve, the rocks at Dairy Farm is the only regularly maintained outdoor climbing spot that offers bolted climbing facilities in Singapore. Unleash your rock climbing skills here and enjoy the scenic nature that the beautiful reserve has to offer while you are at it. While there are climbing routes mapped out clearly, you should always go with a group of experienced friends or join the veteran climbers in the Dairy Farm Climbing Group if you are still relatively new to rock climbing. Simply join their group and get involved in their next climbing event as they will be happy to guide you and even share their cool climbing equipment. Gravity does not exist at iFly Singapore and everyone should experience at least once in their lives. As Singapore’s first and only indoor skydiving facility, iFly Singapore simulates freefalling through the air from 12,000 feet and allows you to experience skydiving without having to spend a fortune by getting on a plane to do so. Turn your dreams of flight into a reality without any of the risks that come with real skydiving. Experience it all for yourself – no fear, no parachutes required, just you drifting on a cloud of air with a professional instructor guiding you every step of the way. All you need is just a sense of adventure for a fun time at iFly Singapore! Zipline through paradise from the top of Sentosa’s Imbiah Hill towards the coast of Siloso Beach with MegaZip. Renowned as Southeast Asia’s steepest and longest zipline, get ready for an adventure of a lifetime as you plunge down the lookout at speeds of 60km/h for a stretch of more than 400 metres long and 75 metres above ground. Guaranteeing a truly exhilarating time that you will never forget, don’t forget to try MegaZip out the next time you visit Sentosa for a shot of extra adrenaline. Besides, you will also get to explore the amazing aerial views of the island as you make your way down without having to hike under the sun.